This Code Adam Missing Child Window Decal announce participation in the national program founded by Walmart in 1994 and backed by Congressional Legislation. It indicates that staff here are trained in how to respond to a missing child reported t them. 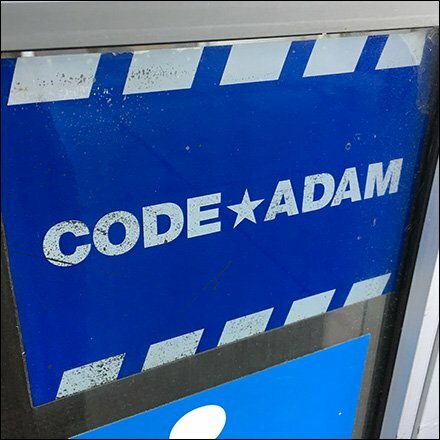 While Code Adam response starts at the store level, ultimately local law enforcement is notified and the broader Amber Alert program initiated. This Code Adam Missing Child Window Decal seen at Michaels, Alpha, New Jersey. Though not noticed on other Michaels stores until now, FixturesCloseUp will look for participation chain wide moving forward.